Should I Retire by the Water? Where Can I Find Retirement Villages by the Water? 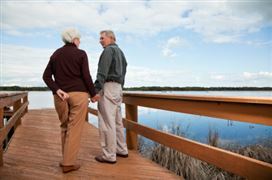 Choosing to retire by the water means choosing beautifully landscaped surrounds, wetlands attracting wildlife and providing trails for leisurely walks, life by the waterfront can be tranquil and refreshing. If you enjoy being close to nature and surrounded by cooling and revitalising elements, this could be what you're looking for. You may fancy a spot of golf or bowls, a gentle walk? In your own private, secluded and calming piece of the world you can soothe your mind, body and spirit.